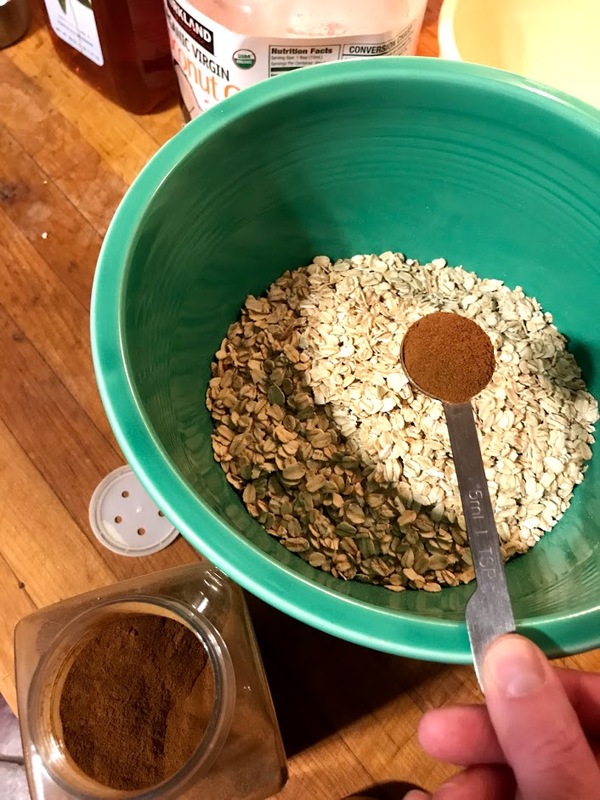 Here is my favorite recipe for homemade granola. This recipe is pretty easy to mix up – add in dried fruits, chopped nuts, use maple syrup instead of honey…you get the picture. I typically add some walnuts or pecans if I have them on hand. If not, the granola still turns out delicious! This recipe makes a large batch of granola. It will usually last about 4-6 weeks in my house. It will keep pretty well in air-tight containers. You could probably freeze it to extend its life, but granola doens. But feel free to half this recipe if you feel like this will be way too much for you. My motto in the kitchen is that if I’m going to spend some time cooking something, I like to make as much as I reasonably can at once so I can stock the freezer or pantry or keep for meals the rest of the week. I like to buy in bulk whenever I can, so I purchase most of the ingredients from Costco. Plus any additional spices you would like to add. First, preheat your oven to 300 degrees. Add the dry ingredients to a medium or large mixing bowl. Next, you need to melt your coconut oil. Measure the amount you need then put it in a microwave safe bowl and nuke it for 15-30 seconds at a time. Watch carefully as your microwave may be more or less powerful than mine. I keep an eye on it and nuke it until it’s *almost* melted because it will continue to melt for a bit after I take it out of the microwave. Once melted, add to a smaller mixing bowl with the honey and whisk until combined. If your house is on the cool side and the honey is cool, this might take a bit before they combine. 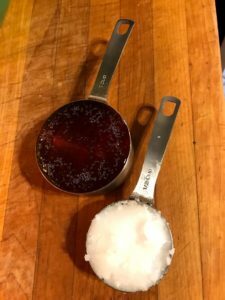 You could slightly warm up the honey so it’s easy to combine, but I have never had to do that step. 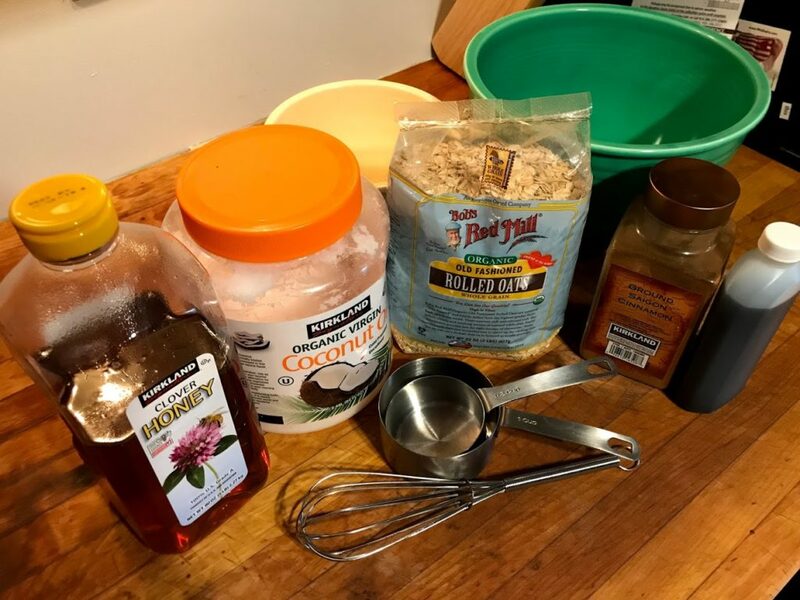 When the honey and coconut oil are combined, add in your vanilla extract and continue to whisk until all three ingredients are combined. This mixture will smell LOVELY! Combine your wet mixture with the dry ingredients using a spatula. Make sure that all oats are wet. Once the wet and dry ingredients are thoroughly combined, divide mixture onto two cooking sheets lined with parchment paper. 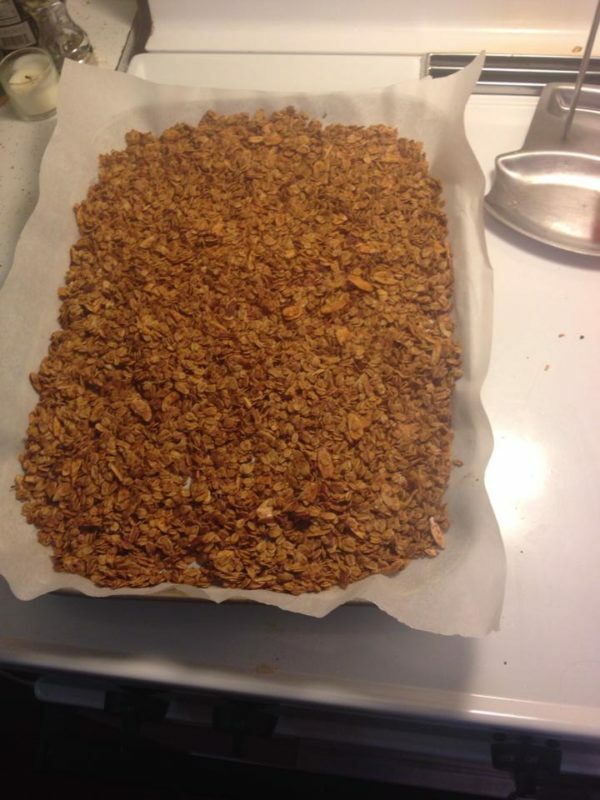 Bake for about 45 minutes, stirring every 15 minutes, or until the granola has reached the consistency you like. Cooking for less time will get you more gooey/sticky granola and vice versa. 1 tsp vanilla extract feel free to add more if you love vanilla like I do! 3/4 cup chopped nuts Completely optional. Pecans and/or walnuts are my favorites to add here. Mix dry ingredients in a medium or large mixing bowl. 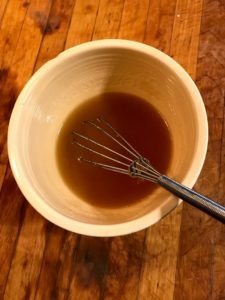 Whisk melted coconut oil and honey in a small mixing bowl. Once combined, add vanilla extract and whisk until all three ingredients are combined. Combine wet and dry ingredients, mixing carefully to ensure that all oats are coated with the wet mixture. 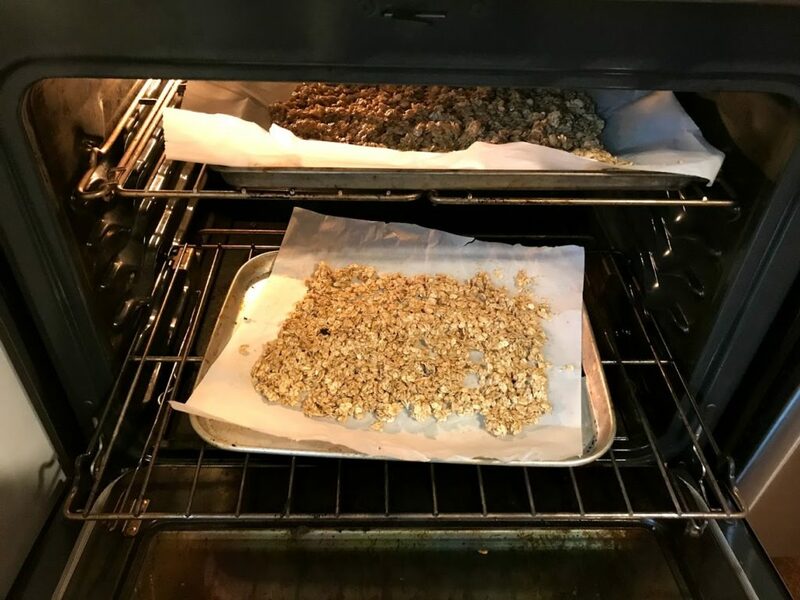 Divide oat mixture between two cookie sheets lined with parchment paper and spread out to cover the sheets evenly. Bake for 45 minutes or until light golden brown, stirring every 15 minutes. Remove from the oven and give the oats one final stir on the cookie sheets to loosen it up before leaving it to cool completely. Once cooled, store in an air tight container. Enjoy with fresh fruit and yogurt (my favorite! ), with milk or by itself!